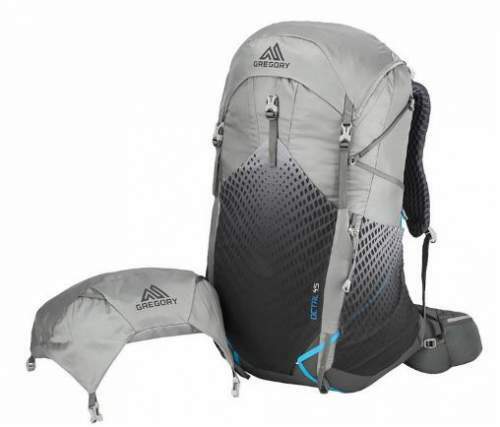 The Gregory Octal 55 Pack For Women is a completely new ultra-lightweight model with an excellent suspension and ventilation system, and with a rain cover included. Gregory Mountain Products Women’s Octal 55. Excellent hip belt and lumbar zone padding. Removable top lid & FlapJack. Gregory has launched a completely new series in 2018, this is what they do every year, but this time they did something special. This Optic & Octal series (for men and women, respectively) is ultra-lightweight. Now, the word ultra-lightweight only has meaning when you compare the pack with some other packs, and you will have this below. But the point is to make a pack which still has all necessary features which you need on the trail, and these packs have them, you have seen some of the key features above, more below. The Octal series includes this 55 liters pack and also Octal 45, and the packs for men are the Optic 58 and the Optic 48. They all share the same basic features. As the title suggests, the pack is built for women, so you have some features appropriate for women’s body, like a narrower harness, narrower back padding zone, more padding at certain places, smaller and softer buckles, and angled hip belt fins to follow the women’s body shape. With 55 liters volume capacity and 35 lb (16 kg) weight capacity, this Octal 55 is big enough for multi-day hiking and backpacking tours. In spite of its sleek design, it has enough attachment elements for these activities and for mountaineering as well. The pack is built in 3 sizes, XS, S, and M, you will see more in the specifications below. This is because it has no harness length adjustment, except for the usual elements like load lifters and straps adjustments. The pack is built with a classic lid, so you have a top access only. Note that the lid is floating and removable, and you can replace it with the included FlapJack which is a cover with buckles that closes the pack, see the picture below. In such a case, the pack looks much shorter and appropriate for overnight and perhaps even day hikes, in particular if you cinch it down with its side compression straps. The lid is removable and a FlapJack is included. The main access is with a drawcord, and you also have a top strap under the lid to cinch the load and to fix a rope here if you have it in the equipment. The rest of the main compartment is just a single simple space with the sleeve for a water bladder. The hose port is in the middle so you can route it along any shoulder strap, see the picture below. The internal hydration sleeve is available. This is the best part of the pack, and the most important one. They call it the AeroSpan system and it utilizes a perimeter frame made of an ultra-lightweight 7001 aluminum and a horizontal anti-barreling bar. It is typical for Gregory’s packs that with such a frame the load is transferred to the generously padded lumbar zone, and this is what you have here as well, see the picture below. A nice addition here is the tensioned mesh which is suspended between the pack and your body, so you have a free air flow in all directions. Such a mesh system I have been using for almost 2 decades now and I am sure there is nothing better against sweating. But you will sweat, this is inevitable. The point is how to reduce it and how to improve the ventilation. The mesh is there for this purpose. You have an adjustable sternum strap which is rail type so you can position it wherever you want. Load lifters also help in adjusting the load and improving the stability. The shoulder straps are contoured and with dual density design, a great design without edges which would create hot spots. A similar design is on the hip fins, so they did not reduce padding to shed the weight, nothing is missing here, see how mighty it looks. Massive lumbar padding typical for Gregory, and a very comfortable hip belt with dual straps. 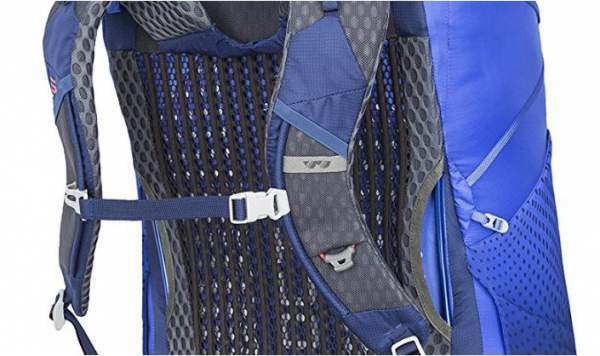 Yet another great feature is visible in the picture above – the dual front straps. So you have two on each side and when you cinch the hip belt you have a perfect hip bones’ hugging. This is the best system which you can have in a hip belt. Observe also that the hip fins are long for a great comfort and hugging. The lid is with 2 pockets, both good size, one external and one underneath the lid. The latter is used also to carry the included rain cover and the mentioned FlapJack. 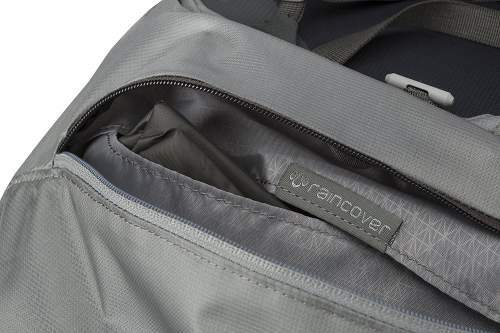 The front pocket is stretchy and very large, and the same material is used for the side pockets. So when they are empty they are quite inconspicuous. But they can take a lot of stuff. 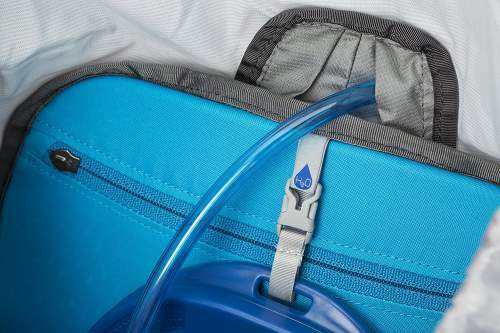 Note that the side pockets are with dual top and side access, the latter is convenient for a water bottle so that you can access it easily while on the go, one is shown in the picture below. They did not forget the hip belt pockets, so you have them two and they are both zippered and very useful. So you have 7 pockets in total. The straps are narrow but strong. You have two of them on the bottom for a sleeping pad or bag, or for a tent. 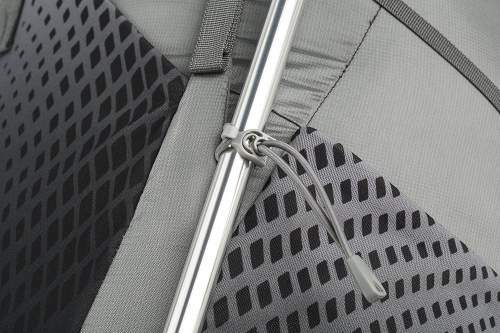 There are loops for the trekking poles, and those are in pair with bungee tie-offs on the front, one is shown above. 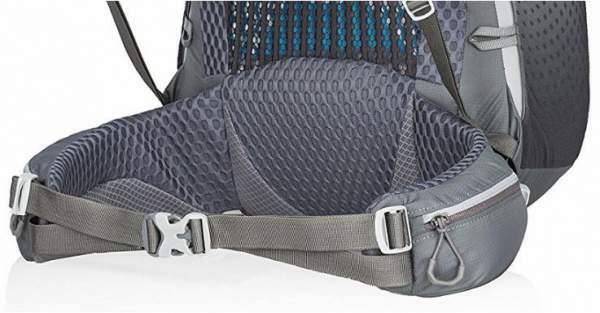 The side straps are V-shape and very functional (see the picture below), there are two of them on both sides. The lower are with inside-out design, so you can use them through the pockets or over the pockets. On the left shoulder strap, you also have the QuickStow bungee cord for glasses, see the picture below. There are several attachment webbing loops on the lid and on the front. The adjustable sternum strap and the QuickStow attachment for glasses. 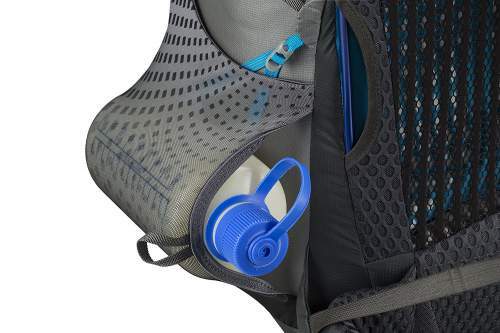 The volume/weight ratio here is 50.5 liters/kilogram, there are no many packs on the marker that are close to this value in a pack with so many features. The Amazon price for the Octal 55 at the moment of writing this text is $210. So I shall say what is obvious, it is expensive. The rain cover makes the pill less bitter, if you would order it separately you would pay around $35. This makes the pack alone around $175 which sounds much better. Best use: hiking, mountaineering, backpacking. – XS: 2.31 lb (1.05 kg). – S: 2.40 lb (1.09 kg). – M: 2.52 lb (1.14 kg). – XS: 2.20 lb (1 kg). – S: 2.29 lb (1.04 kg). – M: 2.42 lb (1.1 kg). Rain cover weight: 0.2 lb (0.09 kg). – XS: 3173 in³ (52 l). – S: 3356 in³ (55 l). – M: 3539 in³ (58 l). – XS: 24 x 12.5 x 10.5 in (61 x 32 x 27 cm). – S: 26 x 12.5 x 11 in (66 x 32 x 28 cm). – M: 28 x 12.5 x 12 in (71 x 32 x 30 cm). It is always good to compare a pack with other brands in order to understand its features and to realize if it is expensive or not. So here I give the Octal 55 side by side with two top-brands’ packs, all are models for women. You realize that those are not a match for the Octal 55 pack. The Granite Gear pack is lighter, but it is without many essential features. Please follow the links in the table to read more. So this was my Gregory Octal 55 Pack For Women review, as you see they have built an excellent pack, with many great features and an incredible weight. The most important part of any pack, the suspension system, is as great here as in any other Gregory’s backpack. Nothing can go wrong with such a design. I can fully recommend it. If you need a smaller pack from the series, please check its smaller cousin the Octal 45 pack. 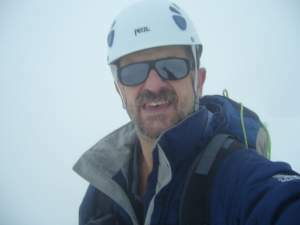 If you need something different or more affordable, please visit my page with packs in the range 35-55 liters, many top-notch items are presented there in detail. Will this fit a BV500 bear bin? I have never used a bear bin, so do not know if you mean to carry it vertically in the pack or horizontally. Its dimensions are (L x D) 32 x 22 cm (12.7 x 8.7 in) while the pack’s width is around 31.7 cm (12.5 in), so it may be hard to put it horizontally. But if you would put it vertically, no problems at all, the S-size pack is 66 cm (26 in) high.